Where Josh Donaldson might be leaking force at impact. Start their first name with the letter “J”. Average speed off the bat was 103.7 mph. Average speed off the bat was 104.8 mph. Joey Bats played 40 less games in 2013, but still outhit Josh Donaldson. So let’s answer the question of how Bautista hit each homer, on average, 9 feet further, and drove the ball 1.1 mph faster off the bat. Swinging in sand: effortless power or powerless effort? Both hitters “stand tall” before falling forward and “getting shorter” into the turn. This lifting of the torso is like running versus walking. When running, our heel hits the ground creating a compressive force that is equaled to NINE-times our body weight, Dr. Gracovetsky says. Gravity pulls our body down (Un-Weighting Principal), and at heel strike, the ground pushes back in a compressive force. The greater the force, the faster the pelvis opens. The compressive force is softened by the sand, which doesn’t allow the pelvis to turn using efficient spine engine mechanics. To maneuver, the brain has to recruit big muscles to do the work. This is why you get a workout walking on sand…it’s powerless effort, rather than effortless power. In the video, you’ll see Donaldson start opening his pelvis five frames before he weights his front foot. His front foot looks like it almost “hovers” over the ground for 3-4 frames. Opening the pelvis without a true compressive force (gravity and gravitational reaction forces) would be like hitting a baseball while standing on sand! 1.1 mph to ball exit speeds. Post UPDATE: after Josh Donaldson was traded to the Toronto Blue Jays in 2015, this post was picked up by the Canadian National Post (Just above the Jose Bautista image). Also, there was an “upgrade” to his hitting mechanics since this post was first published in 2014. CLICK HERE for a link to an Athletics Nation article talking about a difference in J.D.’s 2013 & 2014 swing mechanics. 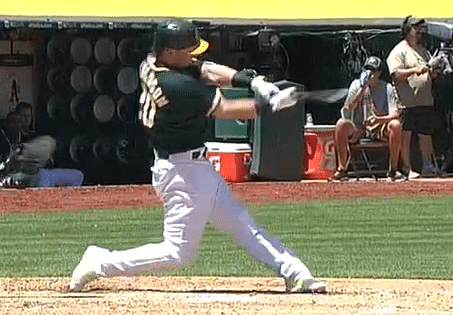 In 2015, Josh Donaldson reverted back to his minimalist “barrel tilt” 2013 hitting mechanics. 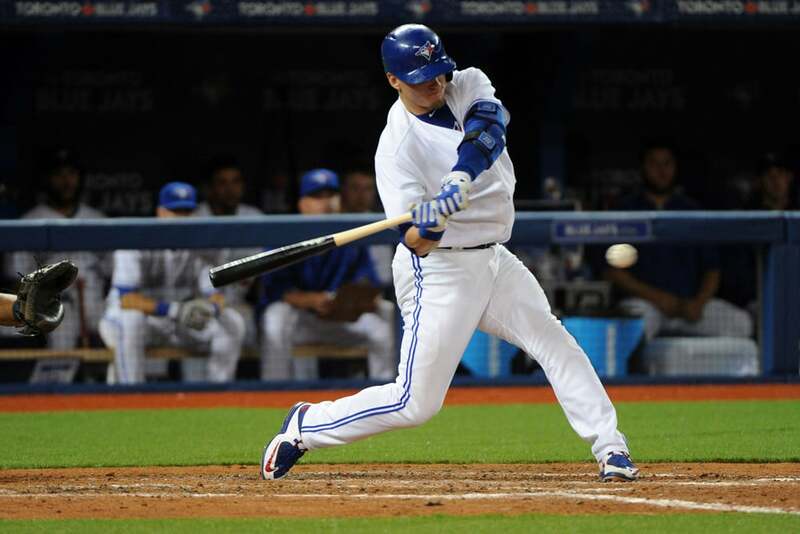 Batting Timing Drills: 2 Little Known Ways To Get "On-Time"
Nice presentation again Joey. Boy … you are a guy who gets right down to the nuts and bolts – where the rubber hits the road. The way I see it, and just to add something to what you are saying, Jose is waiting and his swing is more explosive than Josh. Josh more or less eases into his swing, and that lets the energy out more slowly – like pinching the opening of a balloon and letting the air come out gradually. Jose takes a pin and punctures it so it blows right up. Bob, you’re right on! Check out Dr. Serge Gracovetsky’s book The Spinal Engine I referenced in the article. It’s $100 but well worth the insights. This article really cuts to the chase when coaches ask about minimal or no stride. These options don’t allow gravity and gravitational reaction forces to work for a hitter. These stride minimalist hitters become “energy-hogs”, and never really transfer 100% of their body’s potential and kinetic energy into the ball. I was watching your josh donaldson and jose bautista video and was reading the article where i saw that opening the pelvis before heel strike is bad. So does this mean that I should keep my front foot closed until right before it hits the ground? Then open it up 45-75 degrees? I guess the question is when should i start opening my pelvis. Right before or after heel strike? Tyler, it’s not bad to open the pelvis early before landing. Bautista does this too. The problem is efficiency. Bautista uses Gravitational Forces better. The important thing is to commit your body weight forward and land with an open front leg (foot at 45-70 degrees). Joey – great analysis and very useful information for coaching. A question on Donaldson’s front foot hover. The first pitch (could not tell on the 2nd) looked like it may have been off speed, could Donaldson be early, and using the hover as a slight hesitation to hit the off speed? You may have looked at 20 pitches and he does this on every pitch. I am only asking based off the one pitch. Winn, great question and one I posed to Dr. Serge Gracovetsky over email. He seems to think Donaldson is keeping his weight “back” enough not to commit on the off speed pitch. I teach more of get the foot on the ground and use the front knee bend to buy more time, like what Jaime Cevallos says. Teaching what J.D. would prove difficult to young hitters. My advice is to teach Cevallos’s “cushion” or “double cushion” method, instead of the “hover”. I’d rather have a hitter committing to their front side, then snapping back during the Final Turn. This commitment taps into Gravitational Forces better, and you can definitely see the different ball exit speed and batted ball distance affect between Bautista and Donaldson. Just checking out your study of forward momentum with Hank Aaron after finding the Willie Mays picture and watching clips of him. 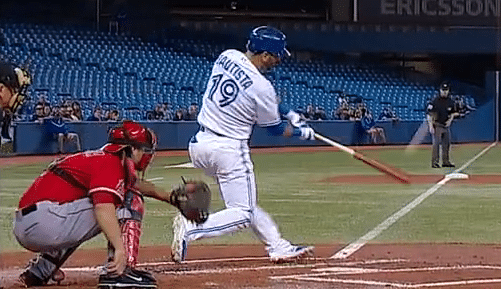 In this Donaldson/Bautista article, both are using foward momentum but are opening their pelvis prior to heel strike with Donaldson doing so more so than Bautista. You are not advocating that the pelvis open before heel strike, are you? The pelvis opens as a result of heel strike/foot plant due to GRF. It is similar for pitching. Correct? No, I don’t teach my hitters to open their pelvis pre-stride foot touch down. This would be difficult for younger hitters to do anyway. We want them to use the ground reaction forces to spin the pelvis. The coupled motion of the spine can work in space without gravity. But when you add ground reaction forces, it amplifies the effect. Most likely Donaldson, because he starts so closed off, has had to develop premature opening of the pelvis to compete against inside pitches. It works for him because of how much forward momentum he gets. Thanks, Joey, great stuff. I can’t think how anyone can teach hitting without knowing this stuff. I totally agree. But they do, as you know. Based upon what you stated this article, why did Texas pitch him on the inner half yesterday when he opens his front foot so much? Yes, the Texas pitcher might have tried to get it further inside like the previous pitch, but I’m throwing sliders away. Joe, Donaldson is REALLY good at ‘blocking’ his shoulders from opening too early. He’s staying spring loaded till the last possible second. His hips don’t get in the way like guys that stride closed do. Unfortunately for pitchers, Bautista crowds the plate somewhat, so anything on the outer half, he yanks into the LCF bleachers. I think he tried to get it up and in like the previous pitch, but missed. Donaldson crushes Bautista now if you were to do a comparison of those same stats. He has actually crushed him pretty much since the article was written. Age drain by Bautista, or did Donaldson make some adjustments that improved his ability to consistently drive balls? Justin, I fear you may be right, and most likely there’s some psychological challenges as well…Andre Agassi went through similar growing pains later in his career. Carlos Gonzalez Killer Power Strategy Video Troy Tulowitzki Part-2 VIDEO: Stride Length Killing Your Bat Speed?